On Friday, we learned that the unemployment rate fell to 4.4% in April. This is one of the most widely followed economic indicators … yet it tells us nothing about the future. All we know is that businesses were hiring in April. They did this because business was good in March. Hiring and firing decisions are made based on the past. This means the unemployment rate isn’t very useful for stock market investors. Few economic indicators look ahead, but one that does is the Institute for Supply Management (ISM) Report on Business. Every month, ISM surveys purchasing managers in factories. Purchasing managers are at the leading edge of the economy. Their job is to buy the raw materials to meet new orders. If they buy too little, they miss delivery deadlines and lose sales. If they buy too much, they waste money with excess inventory. Profits depend on purchasing managers knowing the state of the economy. This makes the ISM survey a must-read for serious investors. The report is released the first business day of every month, so it provides a real-time look at the economy. All 10 of the report’s data series indicate the economy is growing. Based on history, the data show that when purchasing managers are as optimistic as they have been in the first four months of the year, gross domestic product grows about 4.1% on an annualized basis. This tells us we should be bullish. But we need more data to time trades. Another data report, this one from the government, can be combined with ISM data to forecast the stock market. Every month, the Commerce Department releases a detailed report on new orders of durable goods. These are items expected to last at least three years. Durable goods include refrigerators, automobiles and factory equipment. When durable goods orders are up, both businesses and consumers are confident in the economy. This is bullish for the stock market. Durable goods orders can quickly be converted to a stock market indicator. One of the key components of the Report on Business is the New Orders Index. If the index is up, we buy stocks when the level of new orders is higher than it was a year ago. If orders are down year-over-year, we sell stocks and hold cash. Right now, the indicator is bullish. 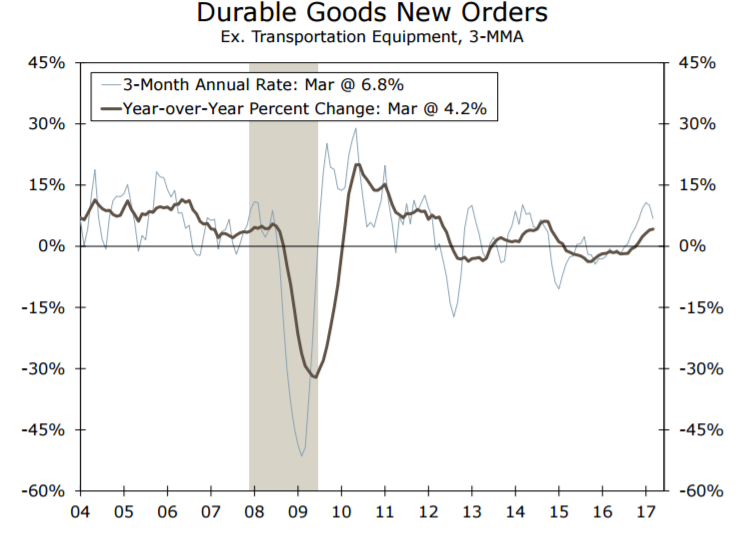 The chart below shows durable goods orders are 4.2% higher than they were a year ago. This is not a perfect indicator. It gave a sell signal in 2008 and avoided the bear market that began that year … but it stayed out of the market until 2010, more than a year after the bottom. The indicator did catch the 10% stock market decline in 2012, however. It also moved to cash as stocks moved sideways from late 2014 until December of last year. That buy signal came about one month into the Trump rally. With new orders for durable goods, we have another reason to expect more gains in stocks. There could be a short-term pullback along the way, but that should be looked at as a buying opportunity.